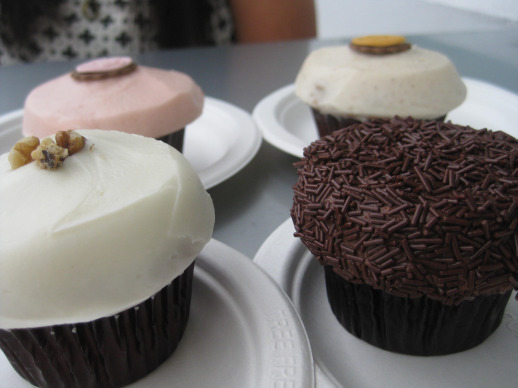 The esteemed cupcakery that is Crave Cupcakes in Houston has quite a following. I finally scoped it out last weekend with Kim as my gracious guide and I have to say a lot (not all) of the hoopla seems to be good marketing, great location, and lack of cupcake competition in Houston. 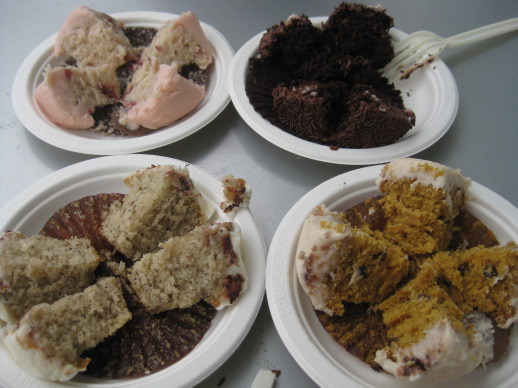 The cupcake competition in Austin is much higher, yielding in my opinion, better qualities cupcakes. 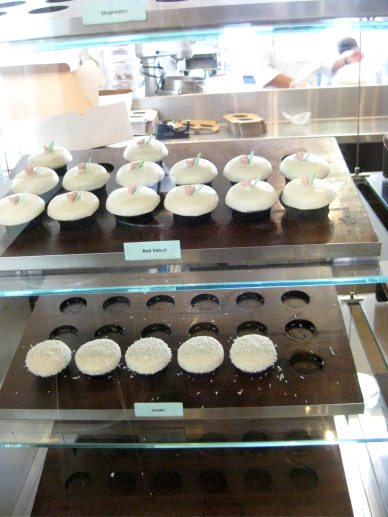 Crave does have decent cupcakes, the icing is a bit overpowering (except for the dark chocolate cupcake I sampled), the cake flavors and textures were almost too muted (again, save the dark chocolate cupcake). However, they do get a gold star for packaging and presentation. 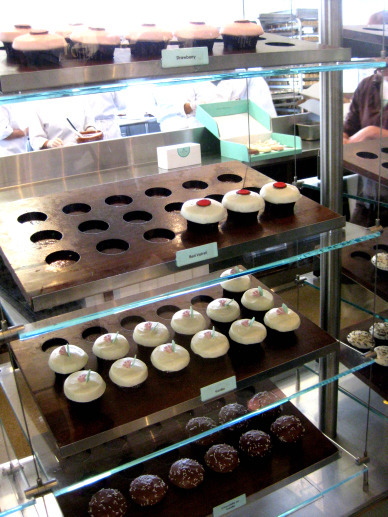 The cupcakes are SO cute! Little prissy things. I’m usually not a fan of priss but when done in miniature, like a little girl’s Easter dress or a cupcake, it does elicit a few coos of adoration. Look how darling these are. Flavors I sampled with the lovely Kim: Dark Chocolate (winner! ), Pumpkin, Strawberry (has chucks of strawberry in the batter which was a nice touch! ), and Banana. All priced at $3.25 a piece. 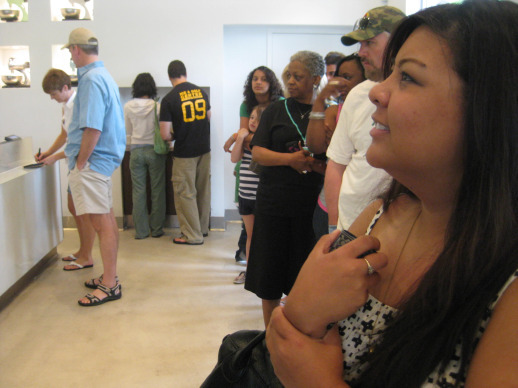 Inside the establishment, it’s quite a mad house and not the warm, cozy kind of bakery I’m used to. 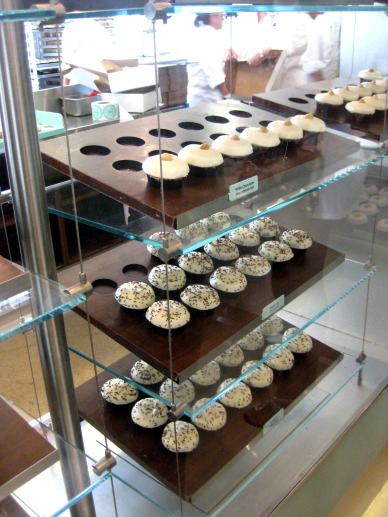 Rather, it feels like a cupcake factory. You can see the bakers through glass and behind the counter cranking out the babies in quite an efficient and busy manner. Though their factory line is not warm and cozy, it does possess a little bit of magic. Reminds me of little elves at a workshop. Look for hints of them in the next three photos below. Another close up on our loot. 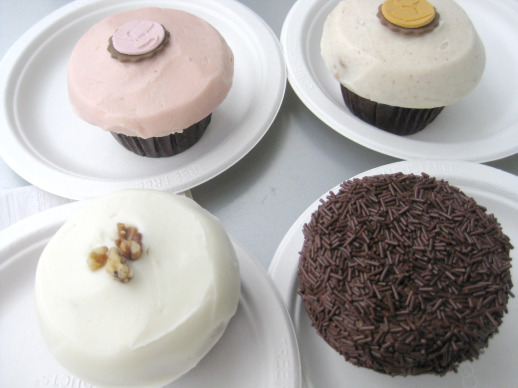 You can probably guess which cupcake is which flavor, can’t you? All in all, it’s not bad. It’s cute. It’s convenient. 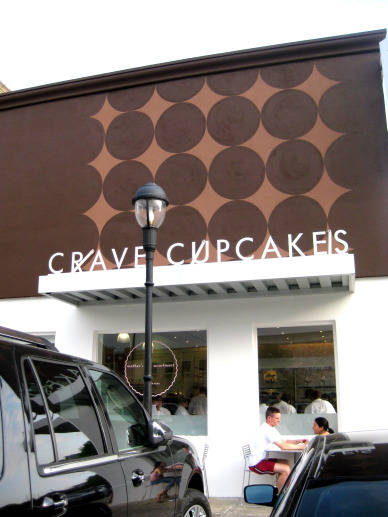 And right now Crave is definitely cashing in on the lack of competition in Houston.